In the centre of the table is a row of cards each showing a different city (the number of cities depends on the number of players). Each city has its own specific set of cards – each showing either an amount of money or something bad. One card of each city is placed face-down next to that city – this is what the player who controls that city at the end of the round will win. The remaining city cards are shuffled together and then dealt out to the players which gives them 5 each. As each set of city cards has a different colour card back, players can see which cities their opponents have cards for but not their values. Players take turns placing one of their city cards face-up next to the matching city. All the different values of each city’s cards are shown on the city itself for all to see, so players always know what cards are in the game. Therefore, each card that gets placed reveals more about which card remains face-down next to the city. Before a player places a card down, they may place some of their gangster cubes on any one city (just so long as they have more gangsters there than any opponent on that city). The round ends after all players have placed their 5 cards. The player with the most gangsters on each city gets whatever is on the the face-down card next to that city. It can be money, but it can be something bad too: one of their gangsters may be out of play for 1 round, 2 rounds or for good, or the player may now be banned from the city altogether. Before the next round begins, all large gangster cubes used are returned to the players (but the small ones are single use and out of the game). The cards are all re-shuffled and a new round starts. The end of the game is determined by the drawing of special police cards. A new card is drawn part-way through a round (when all players have 2 cards remaining) so players have some idea when the game may end but not too much. That’s it. 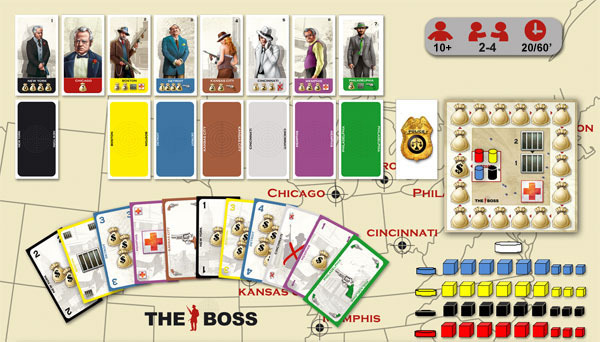 The Boss is actually a very simple game but the interaction between the players as the city cards gets revealed is very entertaining and also full of tricky decisions. Deciding where to put your very limited gangsters is tough – do you add gangsters to a city early to try and secure it, or will this tell other players you know there’s a good card to be won there? 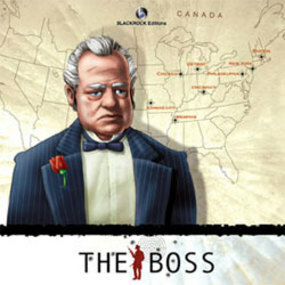 One of our players placed a gangster on a city early on to indicate a good prize was there but that was a bluff in itself – a nice trick and shows there are layers of bluffing within The Boss. Placing your gangsters on cities is very tactical too as you need to consider what you know about the cities, where the other players have their gangsters, how many gangsters they have yet to place, turn order, and so on. As well as the ever-increasing shared information each round, each player has different private information. I think this adds a very interesting dynamic to the game as it means each player has their own view of the game. Also, every card revealed may tell an opponent more than you want it to. The deal of the cards balances well too because a player who has a lot of information about one city has little about any other. Chicago is a special city as there are no other cards for it; instead, the winner of Chicago gets half of the total cash earned from all the cities to its left. Each round Chicago moves one space to the right so the potential rewards for winning Chicago increase. This city adds an extra type of decision which adds further variety when making your choices. It probably won’t be a game that gets an expansion but expansions would be great to further variety (via new interchangeable cities with different card sets, as well as maybe increasing it to 5 and 6 players). I thought The Boss would be an interesting game but it really did deliver a lot more than I expected. I’m really looking forwards to playing it again as well as seeing how it plays with 2-players (which I imagine could be very tactical). 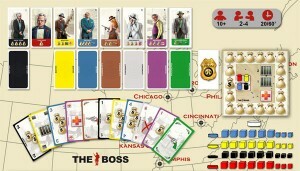 This entry was posted on Thursday, December 16th, 2010 at 10:09 am	and is filed under Board Game Review, Board Games, Essen Spiel 10, The Boss. You can follow any responses to this entry through the RSS 2.0 feed. You can leave a response, or trackback from your own site. Great overview! This caught my attention from the Essen coverage but I didn’t quite get how it was played until now. Added to my wishlist. Thanks!